Why should you give up on cold leads? Personalisation has been a hot topic for Marketing and Customer Experience for quite a while now, and it’s easy to understand why: it just works. Conversations are way more productive and engaging when the person talking to you actually knows you, your preferences and your aspirations. The same goes for brands. However, according to Econsultancy, 38% of marketers still do not personalise any communications at all and - and among those who do, most will only have a low degree of email personalisation. Whilst this is definitely a start, your customer will not understand why you know him so well through email, and so little everywhere else - so your brand loses credit. However, we understand that full personalisation is easier said than done. First, you need to build your strategy: which information you will use to personalise what. Then, you need to make sure that information is available to use in every channel where you have interactions with your customers - something that is definitely not straightforward if you have a different tool to manage email, website, app, outbound calls, social, and so on. At BySide we eliminate this barrier: all customer data is centralised and can be used to deploy actions in any channel within the same platform. We also provide the feedback mechanisms needed to update customer data in real time according to his reactions to your communications - and to change the content accordingly. Anyone working in Marketing nowadays needs to be familiar with the concept of Marketing Automation and to be able to plan an execute it. However, most still think that marketing automation is simply the ability to automatically send emails according to certain behavioural triggers - such as the ability to send a transactional email whenever the customer finishes placing an order, or to automate an email with a customer satisfaction survey 24h after a brand event took place. Whilst these are indeed examples of automated communications, they are confined to one single channel - email. Unless your marketing is all email-based (which would be…minimalistic, but hey, who are we to judge), to call this marketing automation is a little farfetched. It happens because most marketing automation management tools are, in fact, email marketing automation tools. 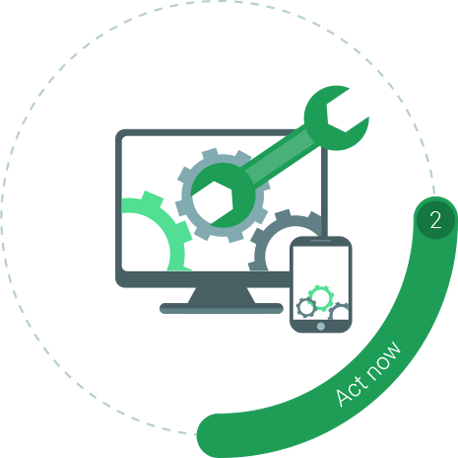 At BySide, we believe that our customers should have the ability to use a trigger coming from any brand touchpoint (website, app, contact center, store, …) to deploy an action in any channel, not just email. Our real-time workflows will take care of the repetitive tasks involved in customer engagement activities, regardless of where they are meant to take place. The ultimate goal is to increase efficiency by freeing up marketing and sales teams so they can focus on lead nurturing strategy rather than processes. Most companies will manage leads through their CRM systems, which can range from very simple tools to sophisticated software with many, sometimes tailored, integrations. They will use CRM (or any other customer database) to create contact lists for specific lead nurturing actions. That’s fine, but think about data quality - is your data being updated in real time with information from a lead’s interaction in your website or app? Does it synchronise information gathered at your stores or at the contact center? If it doesn’t, that contact list you’ve just built for a newsletter aimed at leads who haven’t downloaded or picked-up a catalogue (for instance) might be very inaccurate. And, most importantly, is that information actionable? Can you filter your leads and create retargeting lists to customize content on your website or app, and do it all within the same platform? BySide Multichannel Lead Management was built to bridge the gaps you normally find in a non-integrated solution. It represents the ability to acquire, respond and manage incoming leads, combining real-time information on lead activity across channels, and the ability to deploy targeted marketing actions based on that same information. The ability to acquire, respond and manage incoming leads as well as to deploy targeted marketing actions based on that same information. Lead Nurturing is the good looking marketing term for something humans have been doing since they exist - build positive relationships to create positive outcomes. It consists on raising your company’s profile in the potential client’s eyes by sharing relevant and personalised content at the right time. It all sounds very “techie”, but in reality it’s something that happens in very traditional environments, like in a local market, in which you have a very close relationship with the person who is willing to sell you something. It’s a matter of trust. And the big challenge is to build that trust when you are selling to the mass market, and particularly in digital environments. Trustworthy relationships cannot be built by simply bombarding customers with untargeted, irrelevant communication. Instead, it’s critical to learn how to manage actions and send relevant content to the right audiences, at the right time, across all marketing channels. BySide offers the tools you need to start adapting your communication in real-time. When building a webpage, design and content are always major concerns. Decisions over these matters are often difficult to take: everyone has an opinion based on their personal taste and on what they think will work best. But if you are focused on driving performance, decisions should not rely on these subjective views - your options and hypothesis need to be constantly tested. A/B testing is the way to do so: a truly simple and effective tool to improve your conversion rate. It provides you with the best answer on which content elements work best, allowing you to make efficient, data-driven business decisions. A/B Testing should be used every time you want to make sure that any proposed changes favour your conversion goals. But they should also be used proactively: if you constantly test new content, you will be constantly improving conversion. The moment one test ends, another one should begin. BySide A/B Testing has great features: you can test as many variants as you’d like, you can test any type of content, set different variant distribution criteria, different conversion goals…But the best thing comes from integration with other functionalities, such as personalisation - for instance, you can test if personalisation based on location works better than personalisation based on the origin of visit. A truly simple and effective tool to improve your conversion rate.